G. Preston Smith Thinks He was Final Soldier to Cross Bridge. 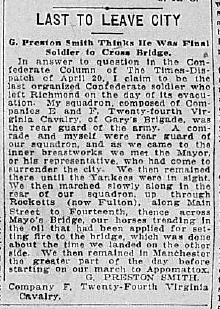 In answer to question in the Confederate Column of the Times-Dispatch of April 20, I claim to be the last organized Confederate soldier who left Richmond on the day of its evacuation. My squadron, composed of Companies E and F, Twenty-fourth Virginia Cavalry, of Gary’s Brigade, was the rear guard of the army. A comrade and myself were rear guard of our squadron, and as we came to the inner breastworks we met the Mayor, or his representative, who had come to surrender the city. We then remained there until the Yankees were in sight. We then marched slowly along in the rear of our squadron, up through Rocketts (now Fulton), along Main Street to Fourteenth, thence across Mayo’s Bridge, our horses trending in the oil that had been applied for setting fire to the bridge, which was done about the time we landed on the other side. We then remained in Manchester the greater part of the day before starting on our march to Appomattox.